Influenced by the detective work of McCall Smith’s other books, I tracked down his earlier work for children. 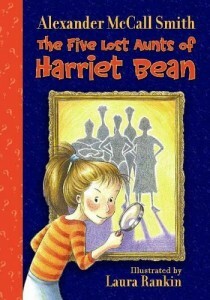 In fact, Alexander McCall Smith created a little detective series for children in the 1990s, revolving around a character called Harriet Bean and her aunts. The first children’s book in the series introduces us to the aunts. In the another children’s book in the series, we meet another aunt and get to solve a mystery with her. There is nothing hard to follow about these books. Each children’s book is really just a fun, silly adventure. They are not as outstanding as the Precious Ramostwe mystery series, and the characters are almost slapstick. However, they are always nice to have when there’s ‘nothing new to read.’ They make good summer reading, as they require little effort. They are slightly dated, since this series is from the 1990s, but I still enjoyed reading them. They are good for 8-9 year old children, probably girls.